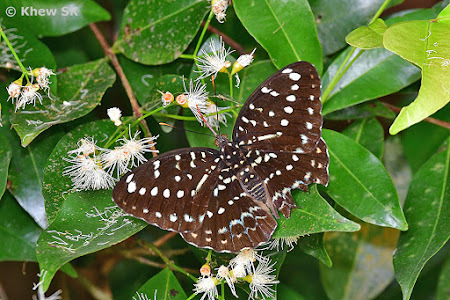 This article features a relatively widespread species of the Syzygium genus, the Spicate Eugenia (Syzygium zeylanicum). 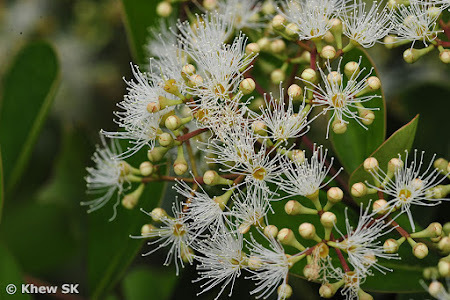 The genus Syzygium comprise flowering plants that belongs to the myrtle family, Myrtaceae. 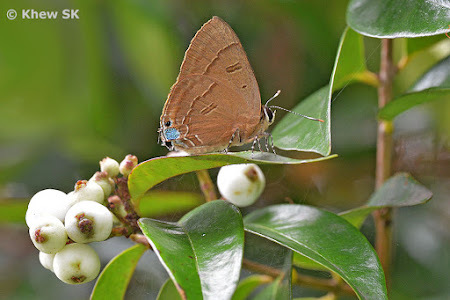 The genus comprises about 1200–1800 species, and has a native range that extends from Africa and Madagascar through southern Asia east through the Pacific. 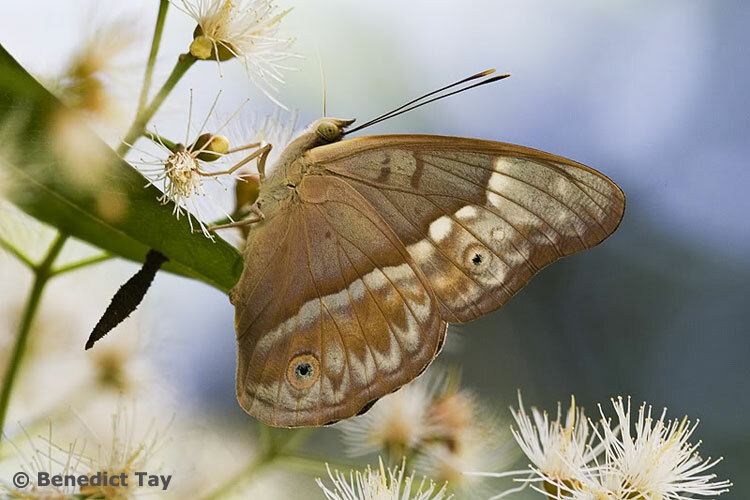 Its highest levels of diversity occur from Malaysia to northeastern Australia, where many species are very poorly known and many more have not been described taxonomically. 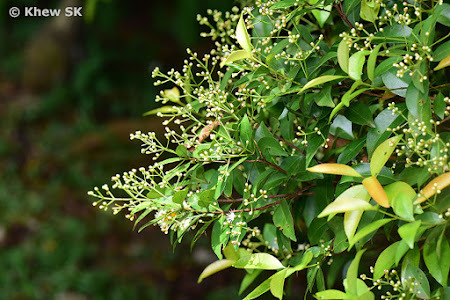 Several species of Syzygium are well-known as a popular local fruit called "Jambu", a pink or red crunchy and thirst-quenching fruit that is often eaten "off the tree". 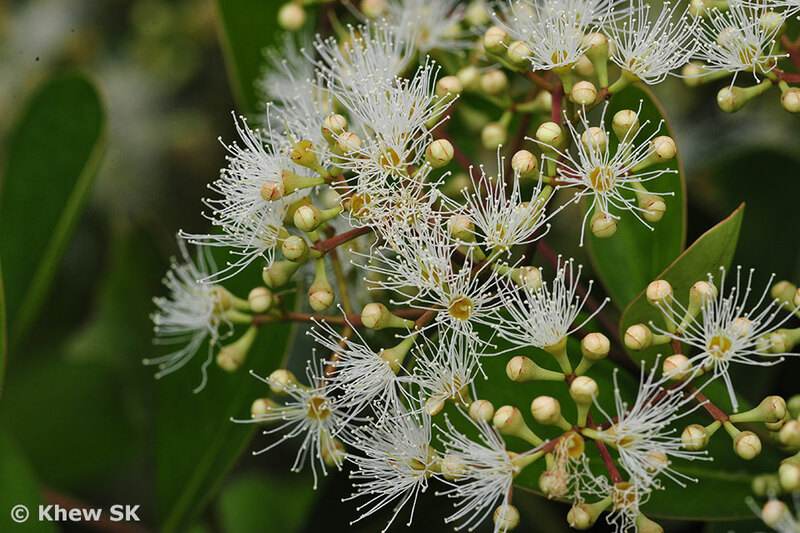 The flowers of the Syzygium spp are quite unique in that they often bloom in bushy white clusters, giving the tree a "wintry" appearance. When in full bloom, many species of the Syzygiums attract insects and other pollinators to feed on the nectar of its flowers. Whilst we feature the Spicate Eugenia as our 15th butterflies' favourite nectaring plant, there are several other local Syzygium species, like S. glaucum, S. myrtifolium, S. lineatum and probably several other species that look quite similar to the Spicate Eugenia and whose flowers are equally as attractive to butterflies. 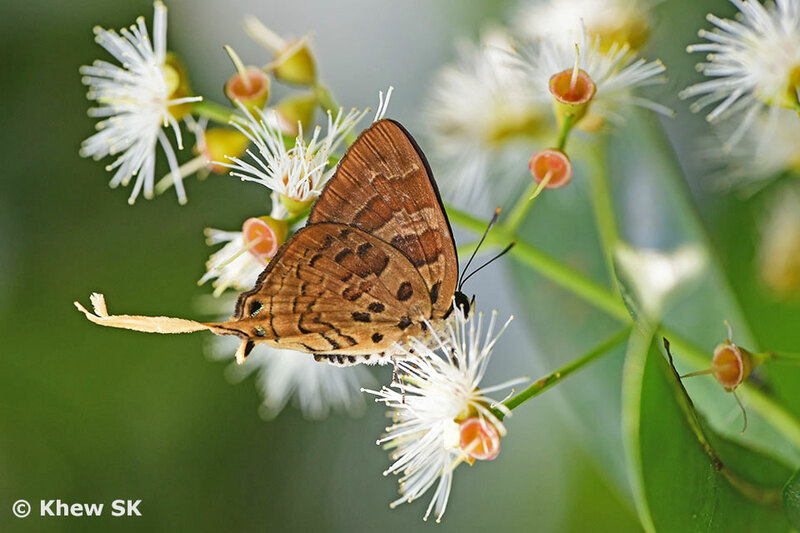 These plants can be found in Singapore's parks and nature reserves and whenever they are in bloom, it is always a delight to enjoy the numerous species of butterflies feeding on the flowers of these plants. 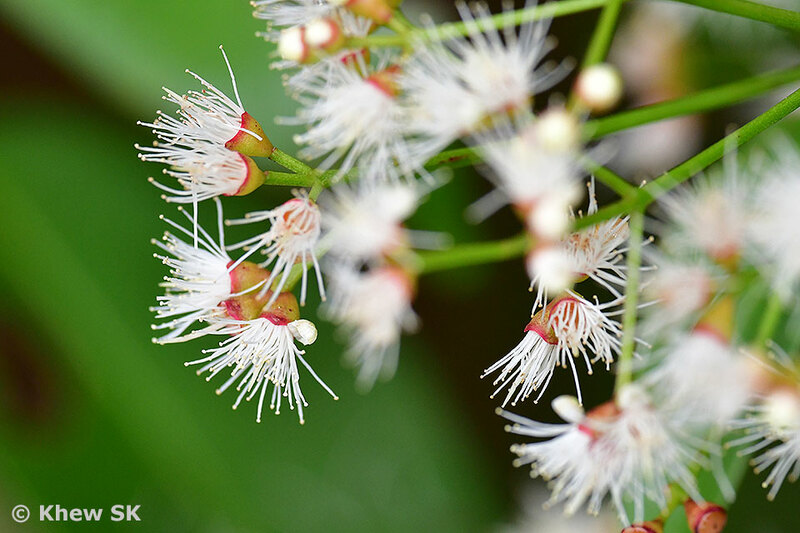 The genus name Syzygium is derived from 'syzygos' (Greek for 'joined'), alluding to the opposite paired leaves. 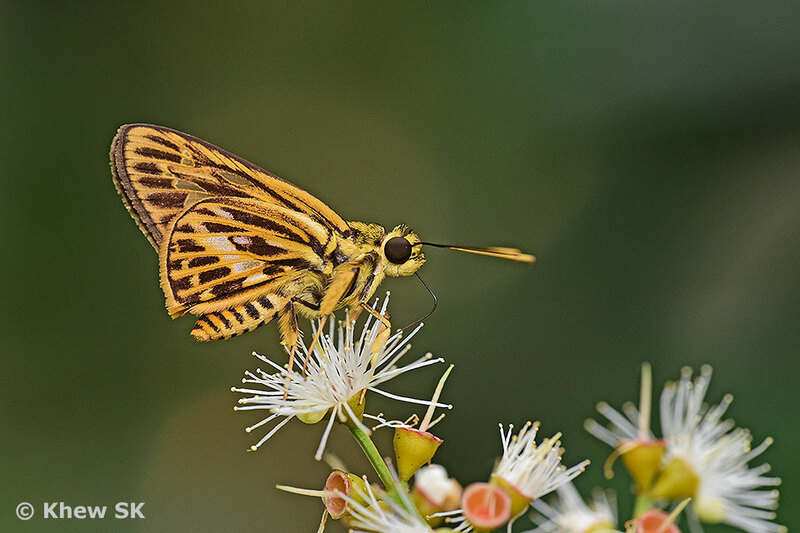 The species name 'zeylanicum' refers to Ceylon (old name for Sri Lanka), where the species is also naturally distributed. The Spicate Eugenia is native to Singapore and has a distribution range across East Madagascar, through India, South China to Southeast Asia. 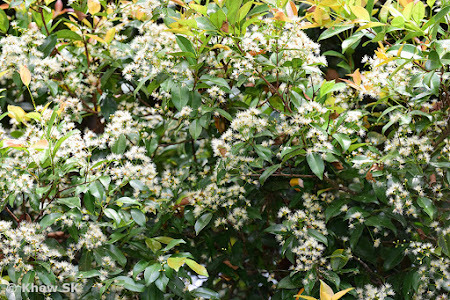 A Spicate Eugenia tree in full bloom. 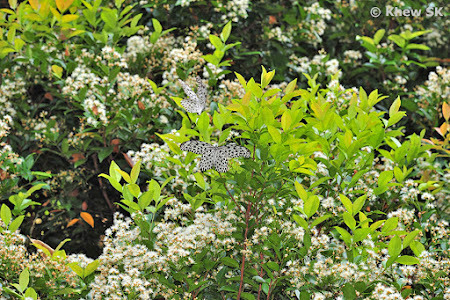 Can you spot the two butterflies feeding on the flowers? The Spicate Eugenia is a small to medium-sized tree that can grow up to 18 m tall, attain 100 cm in girth size, with oval to rounded crown.. The bark of the tree is reddish-brown and papery-flaky in young specimens. 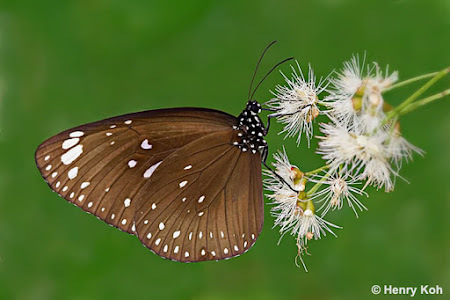 Where cultivated in parks or the fringes of nature reserves, it is planted single in rows or close together to form a hedge or a visual screen. It is sometimes seen growing wild on our natural coastal cliffs such as those on St John's Island and Labrador Park. In other areas, it is cultivated at Singapore Botanic Gardens, Upper Seletar Reservoir Park, Pulau Ubin, Pulau Tekong, Telok Blangah Hill Park and many other parks in Singapore. 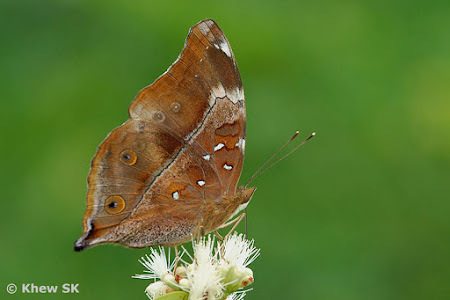 The leaves are opposite, short-stalked and leathery, elliptical to lance-shaped, 5–11 cm long by 2–5 cm wide with a pointed leaf tip. 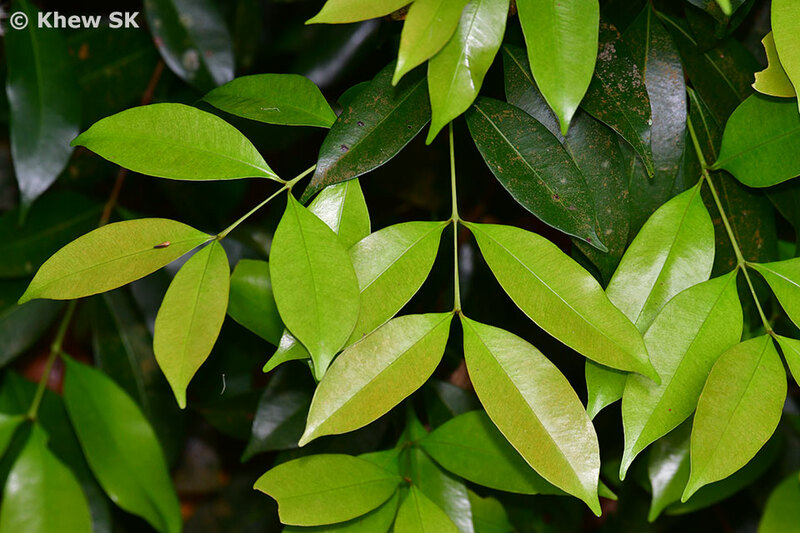 Each leaf has one vein running parallel to the leaf margin, and 10–14 pairs of side veins. Mature leaves dark glossy green above, paler green below, with numerous secondary veins spaced 2-3 mm apart and at 80°-85° angle from midvein, veins conspicuous on upper leaf surface and slightly raised on bottom surface. 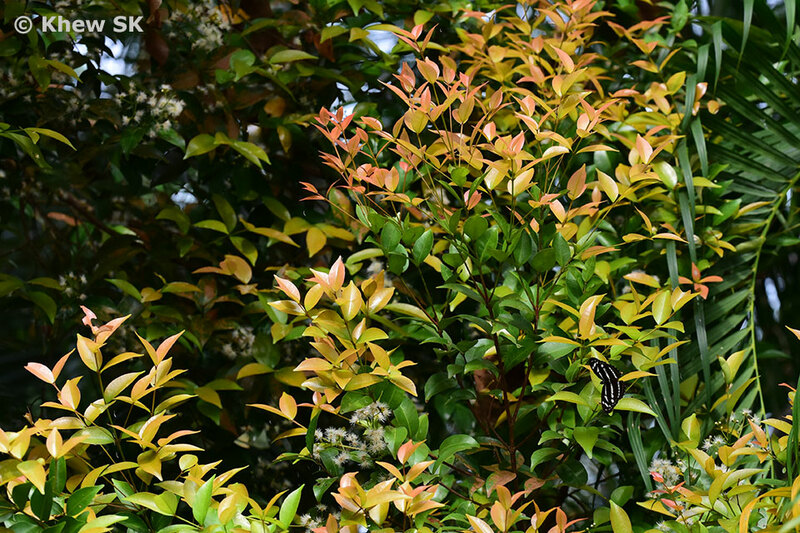 The young leaves are purplish to orangish-pink and very glossy. 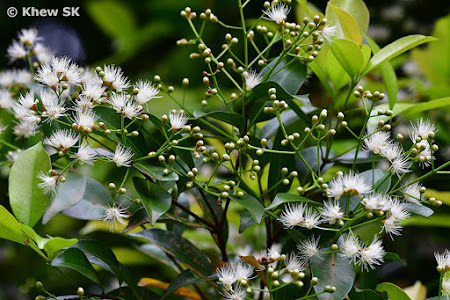 The flowers of the Spicate Eugenia are bisexual and are white, faintly fragrant, and found in up to 2.5–4 cm long flower clusters located at ends of its branches, or axils of its leaves. The flowers are bushy, often described to look like "pom-poms" and are highly attractive to butterflies and other insect pollinators. When in full bloom, the tree looks like it is covered in white "snow". 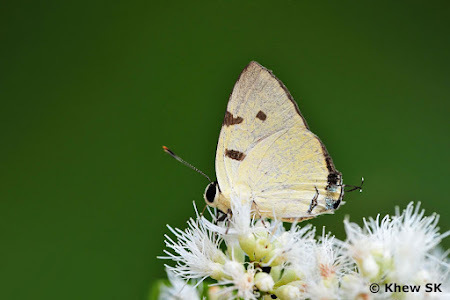 The flowers are delicate, and usually do not last for more than a week. The plant produces fleshy fruits that are oblong-round, 0.5–0.7 cm in diameter, white and each fruit contains one greenish seed. The small berries ripen from greenish to white and freckled with several brownish spots. 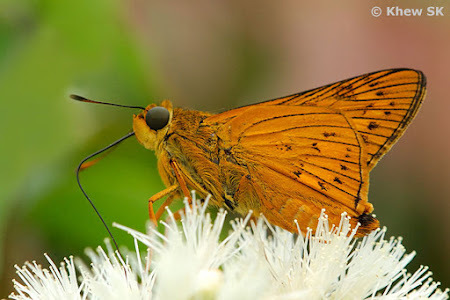 The relatively thin pulp is soft and fleshy, and is edible. 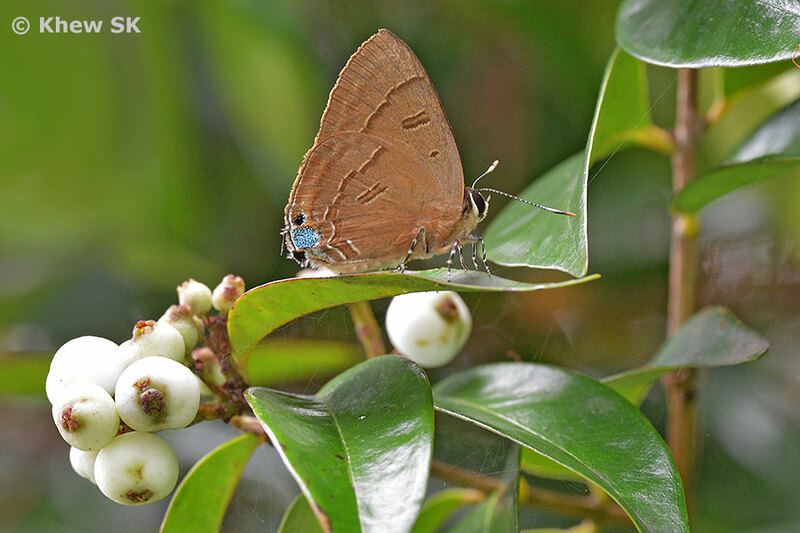 The seeds are eaten by birds, squirrels and other fruit-eating animals. The Spicate Eugenia flowers infrequently - sometimes once to three times a year, and occasionally it may flower weakly and the tree does not reach a full bloom. However, when it does flower (and often several trees in the same vicinity flower together at once), the butterfly species that visit the flowers for their nectar is an awesome sight to behold! 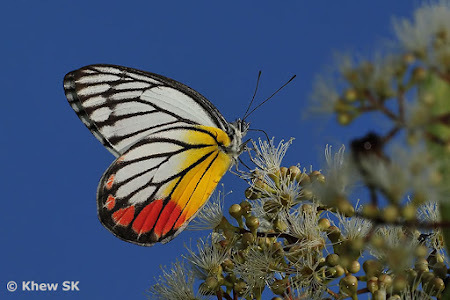 Where the tree grows at the fringes of the nature reserves, many rare and otherwise not-often-encountered species can be observed. A tree in full bloom attracts many representatives from five of the six families of butterflies in Singapore - with the exception being the Riodinidae, which I have personally not encountered any of the species feeding on the flowers of the Spicate Eugenia. 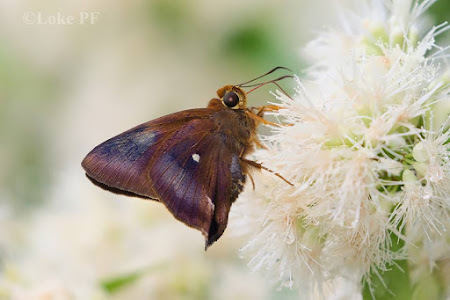 It is interesting to note that the physical structure of the flowers are almost universal to allow butterflies of all shapes and sizes to feed on the nectar in the flowers - from the large Papilionidae to the diminutive Lycaenidae and the long-proboscis endowed Hesperiidae. The Spicate Eugenia is often confused with the very similar-looking Common Kelat (Syzygium lineatum). 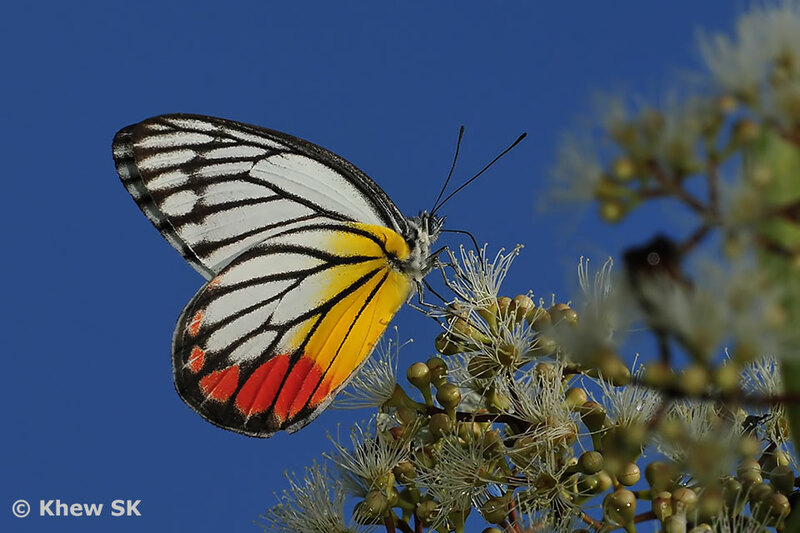 Both trees, when flowering, are equally as attractive to butterflies. The distinguishing veins on the underside of the leaf of the Common Kelat has two veins running parallel to the leaf margin, whereas the Spicate Eugenia's leaf has only one vein. Another related species, Syzygium glaucum, has almost similar looking flowers that are equally attractive to butterflies and is also featured here with several butterfly species feeding on the flowers. 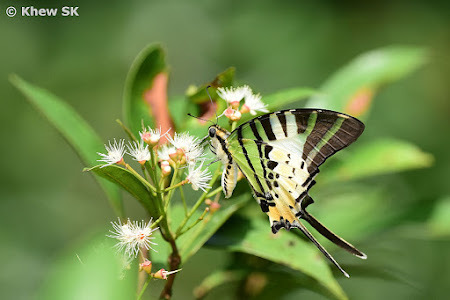 This Syzygium species has been cultivated at Pasir Ris Park near the mangrove walk, and should also be observed for its attractiveness to the butterflies in this urban park. 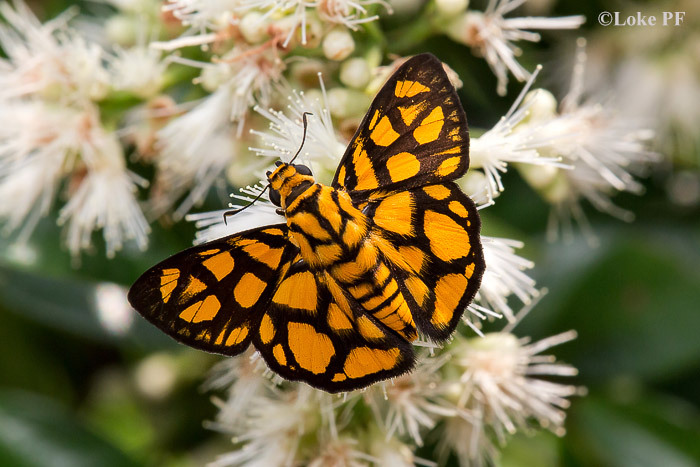 Whilst the fragrance of the flowers is not often detectable by the human nose, once the Spicate Eugenia trees or bushes flower, particularly in nature areas, it will be swarming with butterflies, bees, moths and all sorts of insects. 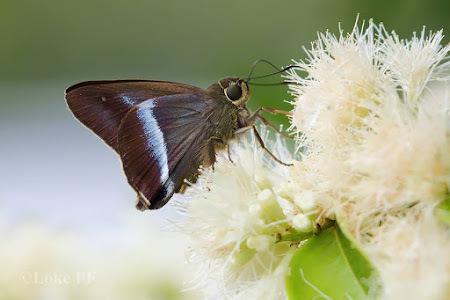 This strongly suggests that the nectar in the flowers must be attractive enough to bring all these visitors, which are otherwise shy and not often observed, to the flowering trees. 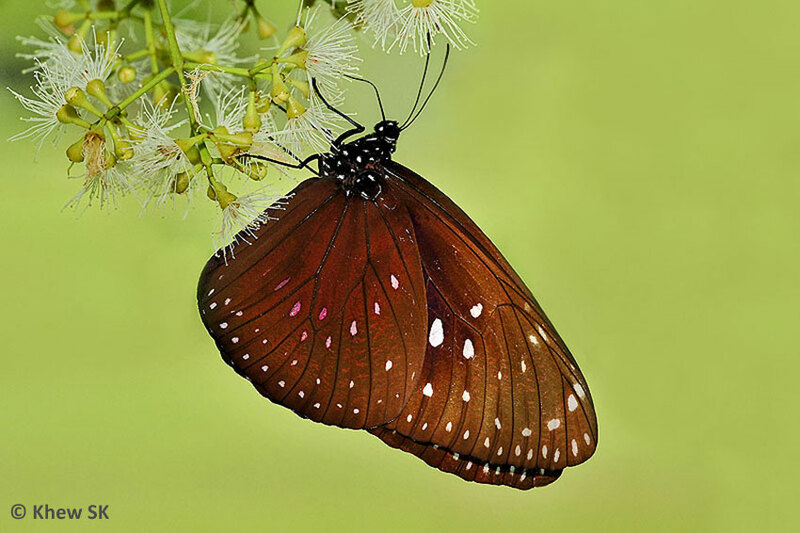 The usually shade-loving Archdukes come out to feed on the flower of the Spicate Eugenia. 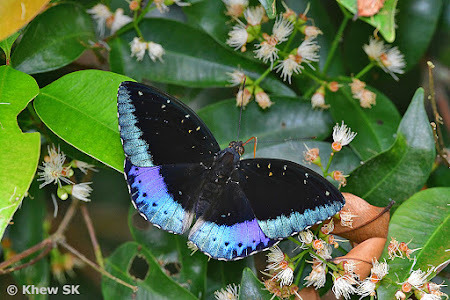 It is always amazing to see so many species of butterflies visiting the flowers of the Spicate Eugenia, and even the ground feeders can be seen. 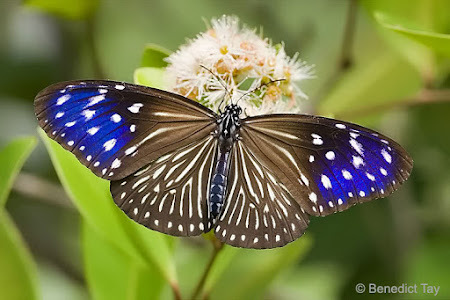 For example, the Archduke (Lexias pardalis dirteana), usually found in the shaded understorey of forested areas and typically feed on rotting fruits on the forest floor, has been seen feeding at the flowers of the Syzygium in the open. 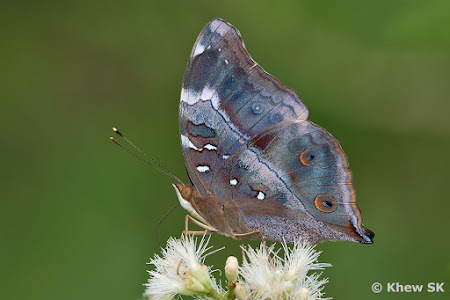 This observation is evidence of a change in behaviour of the shade-preferring Archdukes, whenever they are attracted to the flowers of this plant. For the many other species of butterflies which an observer may encounter when the Spicate Eugenia (and several other related Syzygium spp) flowers, there are too many to name in this article. We will continue to be surprised at the diversity of butterflies that are attracted to this flowering tree and it is certain one of the 'butterfly magnets' that NParks should continue to cultivate, particularly in the vicinity of the nature catchments.